We wholesale to businesses that on sell the product. If you are interested in stocking some of the Ron's Rocks range, please send an email, along with your business name, location and daytime phone number to info@ronsrocks.co.nz. We have a wide range of stock - this website gives you a sample of some of our more popular lines. If you can't see what you're looking for, please get in touch. 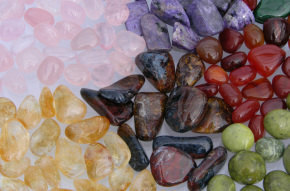 Please note: The information on this website regarding the metaphysical properties of stones is intuitively gathered and not scientifically verified. We advocate individual responsibility for one’s exploration of these ideas, and we do not advocate the use of stones as a substitute for medical or psychological care.